The magic of an English muffin is its unique texture of peaks and valleys that absorb and cradle butter and jam. To preserve these delectable air pockets, true aficionados of the English Muffin know that you want to break it open rather than just slice it with a knife. This splitting tool does the job perfectly by gently breaking it open, leaving two equal muffin halves with perfectly preserved nooks and crannies. This ingenious muffin breaker also eliminates crumbling and the uneven edges that prevent you from enjoying your scrumptious breakfast or snack to its fullest. Whether you make your own from scratch, from a box mix, or buy pre-made from a store, this handy tool is ideal for use on traditional-sized English muffins, mini muffins, and super thick varieties. To use, wash cutting tines with soap and water before first use. Then insert stainless steel tines into the middle and all the way through an English muffin, then pull handles slowly apart. 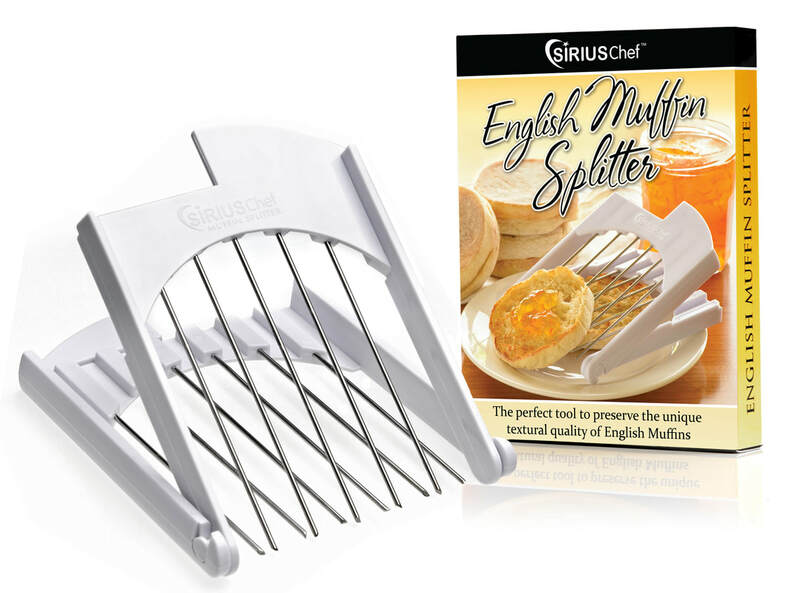 Your foodie friends and family members will appreciate this clever English Muffin Splitter, too, so it's also a great gift idea! Not sold in stores. Preserve the delectable textural quality of an English muffin by gently splitting it instead of cutting with a knife and ruining all those nooks and crannies that cradle butter and jam so nicely! English muffin splitter tool with rounded handles and modern design is approx. 6 x 4.75 inches to easily fit in a drawer. FDA Certified. Stainless steel tines. Durable plastic handles. Top rack dishwasher safe. Handy tool for splitting traditional-sized English muffins, mini muffins, and super thick varieties. Also great for biscuits. The distinctive taste, texture and flavor of an English muffin comes from the "Nooks & Crannies" way of griddle baking originally invented by Samuel Bath Thomas more than 120 years ago. Traditional English Muffins are split, never sliced with a knife, to keep the unique, toast-up-perfectly texture. More on History of English Muffin here. For Wholesale Inquires, CONTACT US here.